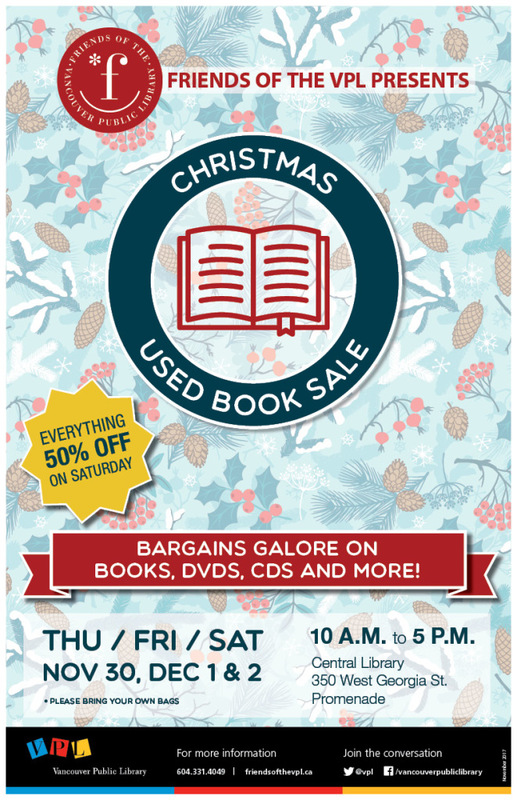 To refresh the books on your shelves or buy books for gifts, come to the Friends’ Christmas Used Book Sale. Volunteers are busy sorting and pricing approximately 8,500 donated books as well as CDs and DVDs for the November 30 to December 2 sale on the Promenade of Central Library. Everything in the sale including books, review books, CDs and DVDs have been donated to the Friends. At the sale you might find a book of special interest or be intrigued by an unfamiliar story – all for the low price of 50 cents for paperbacks and $2.00 for hardcovers. Fiction and non fiction prices vary from $0.50 and upwards. Remember that gently used and unique books are on sale year round at book’mark, The Library Store on the Promenade of the Central Library. Are you ready to clean up your bookshelves, CD, DVD and vinyl collections? The Friends of the VPL accepts donations throughout the year. Please click here to learn where books can be dropped off. Thursday November 30 to Saturday December 2. 10am – 5pm, on the Promenade of the Central Library, 350 W. Georgia. Everything half price on Saturday! Please bring your own bags. Proceeds from the sale support special Vancouver Public Library projects and programs. See what Friends funded in 2017.